“Christmas 1945” is the bestselling non-fiction book from author Matthew R. Litt. In December 1945, WWII was finally over and the country was ready to celebrate after four dark holiday seasons. 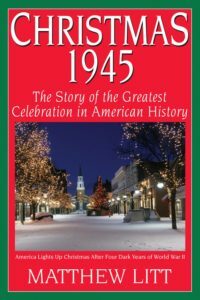 This book tells the true stories of “Christmas 1945 – the Greatest Celebration in American History.” Some stories will make you smile, some will make you cry – all will restore your American and holiday spirit and your faith in humankind. Meet author Matthew Litt, who will talk about the book, in the Officers’ Wardroom of the Battleship on Saturday, Dec. 22 from 11am to 12:30pm. Matthew will also have books available for sale and will sign any book purchased. This event is free to attend with a tour of the Battleship. Matthew has appeared on countless television and radio shows, and in Time magazine to discuss “Christmas 1945.” He has been invited to speak to large groups and small groups, using the true stories from “Christmas 1945” to raise everyone’s holiday & American spirit! The book and presentation are secular, focusing on history and humankind rather than religion. Matthew is also a practicing attorney and a professional speaker who travels the country lecturing on the art and science of persuasive writing. The Battleship is open for tours from 9:30am to 3pm every day, except Thanksgiving and Christmas, through December 31. The Battleship will be open on weekends from 9:30am to 3pm in January and February. The Battleship is closed for tours on New Year’s Day.